Although this book is not designed as an introduction to Stata, it is appealing even to Stata novices. Throughout the text, Mitchell thoughtfully addresses any features of Stata that are important to understand for the analysis at hand. He also is careful to point out additional resources such as related videos from Stata's YouTube channel. The first section contains a chapter that introduces Stata commands for descriptive statistics and another that covers basic inferential statistics such as one- and two-sample t tests. The second section focuses on between-subjects ANOVA modeling. The discussion moves from one-way ANOVA models to ANCOVA models to two-way and three-way ANOVA models. In each case, special attention is given to the use of commands such as contrast and margins for testing specific hypotheses of interest. Mitchell also emphasizes the understanding of interactions through contrasts and graphs. Underscoring the importance of planning any experiment, he discusses power analysis for t tests, for one- and two-way ANOVA models, and for ANCOVA models. Section three of the book extends the discussion in the previous section to models for repeated-measures data and for longitudinal data. The fourth section of the book illustrates the use of the regress command for fitting multiple regression models. Mitchell then turns his attention to tools for formatting regression output, for testing assumptions, and for model building. This section ends with a discussion of power analysis for simple, multiple, and nested regression models. The final section has a tone that differs from the first four. Rather than focusing on a particular type of analysis, Mitchell describes elements of Stata. He first discusses estimation commands and similarities in syntax from command to command. Then, he details a set of postestimation commands that are available after most estimation commands. Another chapter provides an overview of data management commands. This section ends with a chapter that will be of particular interest to anyone who has used IBM® SPSS®; it lists commonly used SPSS® commands and provides equivalent Stata syntax. 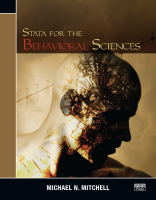 This book is an easy-to-follow guide to analyzing data using Stata for researchers in the behavioral sciences and a valuable addition to the bookshelf of anyone interested in applying ANOVA methods to a variety of experimental designs.